Schlopping is a word, a book, and a way of life. Schlopping is an activity that you do with a loved one and acts as a relationship enhancer; it happens when you decide you want to spend time together with someone you love. The book Schlopping is for anyone who has a loved one and wants to create positive memories that will last a life time. 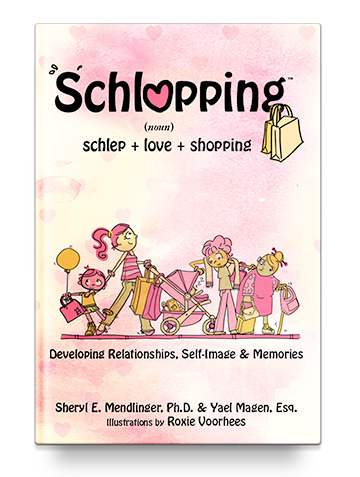 Schlopping is a story of how two completely different people, who happen to be a mother and a daughter, find answers to life’s challenges through their invented wor(l)d of schlopping. A portion of sales will go to research and wellness for Endometriosis & Breast Cancer. Tune in on May 16th! We hope that you join us on our schlopping adventures and look forward to hearing how you and your loved ones embrace schlopping, for better or for worse. You can submit your stories to submitstory@schlopping.com or our contact page. You can keep up with us here on our website, via email at info@schlopping.com , on Twitter with #schlopping, or at our Facebook page. Have fun and don’t forget that life is about experiences, relationships, health and love. Download our Schlopping Discussion questions! Subscribe to the Schlopping Community!